Whipped pink liver mousse with rhubarb-apple preserves and sweet dots of caramelized foie gras sauce at Friday Saturday Sunday. Reader: Call me strange, but I’m crazy for chicken liver. Do you have any favorite dishes around town? Craig: Liver lovers unite! We may be a small and exclusive club, but we are enthusiastic. My Jewish roots led me more than halfway to liver appreciation — but it was an acquired taste. I hated chicken livers when I was a kid because too often they were overcooked. But once I learned what a well-prepared chicken liver can be, in all its forms, I realized they are one of the bird’s most underappreciated assets. They also are among the most versatile, seared to a delicate crisp with faint pink centers and tossed with pasta, chopped into classic deli spread for toasted rye, or turned into the silk of a French-style mousse. How a chef interprets and handles their livers is a telltale signs of a kitchen’s skill. But the deep flavors, range of textures and creative possibilities of the liver dishes you’ll find in Philly prove its value as a local specialty worth its own quest. For classic Jewish variations, it’s hard to top the chopped liver at Famous Fourth Street Deli (700 S. Fourth St.), where it’s served in towering portions. Hymie’s (342 Montgomery Ave., Merion), and the Kibitz Room (100 Springdale Rd, Cherry Hill) are also reliable deli liver purveyors. Crunchy kataifi nests around liver mousse dusted with pistachios atop tart pomegranate jam at Zahav. The CookNSolo restaurants offer fantastic modern Jewish updates to the delicacy, including pastrami-onion jam for the chicken liver mousse at Abe Fisher (1623 Sansom St.) and a stunning Israeli interpretation at Zahav (237 St. James Place), where last year chef Michael Solomonov spun crunchy kataifi nests around liver mousse dusted with pistachios atop tart pomegranate jam. Of course, the art of chicken livers — and, for that matter, using every part of the animal — is an international pursuit. The most memorable chicken liver dish I ate last year was at Lebanese-inspired Suraya (1528 Frankford Ave.), where perfectly pink nuggets were glossed in a wickedly sweet-tart pomegranate molasses that cut their gamy savor. The yakitori tasting at Nunu in Fishtown includes little morsels of liver that come threaded on yakitori skewers. Garnishes with acidity with sweetness are always a plus with liver. At Nunu (1414 Frankford Ave.), the new izakaya from the team behind Cheu Fishtown, little morsels of liver come threaded on yakitori skewers and turn simultaneously creamy and crispy over the grill before being topped with a tart green apple relish. I was recently at Osteria (640 N. Broad St.) and the sublimely rustic rigatoni tossed with chicken liver ragù remains one of the best dishes on Jeff Michaud’s menu, the coarse-chopped livers blended with lots of sage and cippolini onions, then emulsified with pasta water into a sort of magical, earthy cream. Good luck getting a photo of that mud-gray dish. There may not be a less photogenic ingredient in the cook’s pantry. Stroopwafel cookies sandwiched around liver mousse with blackberry agrodolce at In the Valley. That said, a number of chefs have found inventive presentations for liver that are outright beautiful. Like the stroopwafel cookies sandwiched around liver mousse with blackberry agrodolce at In the Valley (1615 E. Passyunk Ave.). Or the rhubarb jelly-glazed slice of tart stuffed with chicken mousse I savored a couple years ago at Mica in Chestnut Hill (8609 Germantown Ave.), so creamy and rich, it was as close to dessert as offal will ever come. But true liver aficionados, I suppose, do not need pretty pastry diversions to pique their passion. A perfect mousse — the kind that anchors charcuterie programs from Andiario to Parc — is sufficient. 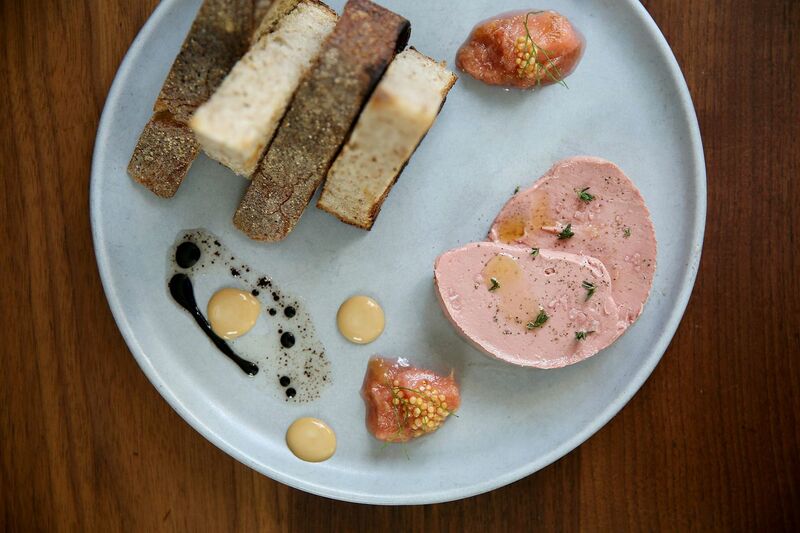 And the most satisfying version I sampled last year was at Friday Saturday Sunday (261 S. 21st St.), where Chad Williams served his gorgeous round of whipped pink liver mousse with rhubarb-apple preserves and sweet dots of caramelized foie gras sauce. Which is about right. A truly great chicken liver dish not only can share the stage with foie gras, it also can play the starring role.